Adrien Gagnon Go Probiotics Irritable Bowel fortifies your intestinal flora and soothes the unpleasant symptoms of an irritated bowel. It fights diarrhea and hemorrhoids and provides 30 billion active cells daily from 12 strains. The delayed-release vegetarian capsules maximize the effects of probiotics. This product provides a high concentration of probiotics (15 billion per capsule) to support intestinal health as well as Prunella to address the mucus and/or hemorrhoid issues of an irritable bowel. Probiotics are "friendly bacteria" naturally present in our intestinal tract. Their primary role is to support digestion and regularity as well as prevent pathogens from invading the intestinal tract. These living microorganisms are one of the body's primary natural defenses. Prunella is the fruit of a shrub commonly known as Blackthorn due to its pointed thorn like spur shoots and very dark bark. Its fruits produce an astringent effect, meaning that they reduce the production of intestinal mucus and help control diarrhea. Directions: Adults take 2 capsules daily. For use during an antibiotic treatment: Take at least 2-3 hours before or after taking antibiotics. † cfu: Colony-forming units ;* 15 billion active cells until expiry date. Consult a health care practitioner prior to use if you have fever, vomiting, bloody diarrhea or severe abdominal pain. Consult a health care practitioner if symptoms persist or worsen. If symptoms of digestive upset (e.g. diarrhea) occur, worsen, or persist beyond 3 days, discontinue use and consult a health care practitioner. 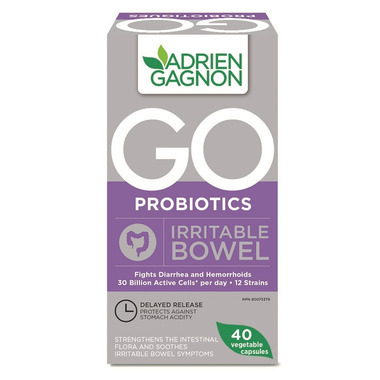 Adrien Gagnon Go Probiotics Irritable Bowel does what it said, help relieved my irritable bowel symptoms since taking it daily. Thanks!